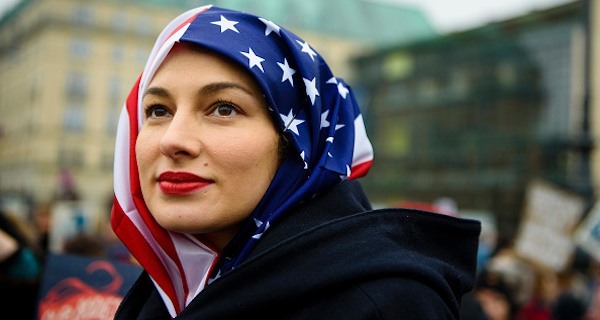 After a presidential election that resulted in a nationwide increase in hate crimes against Muslims, Jews and other minorities, it’s easy to feel disheartened about the state of acceptance in a country once lauded as a sanctuary from religious persecution. But it’s possible that all hope is not lost for a tolerant America. 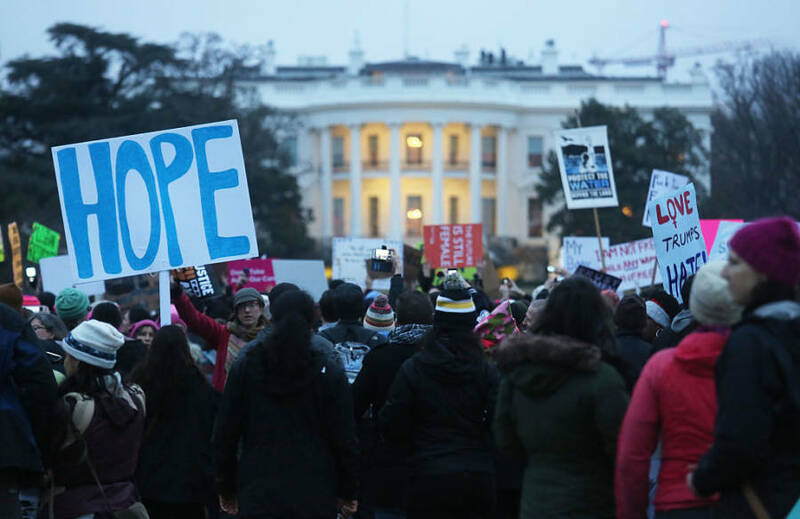 A new poll from the Pew Research Center shows that most citizens’ attitudes toward other religious groups are actually significantly more favorable than just two years ago. 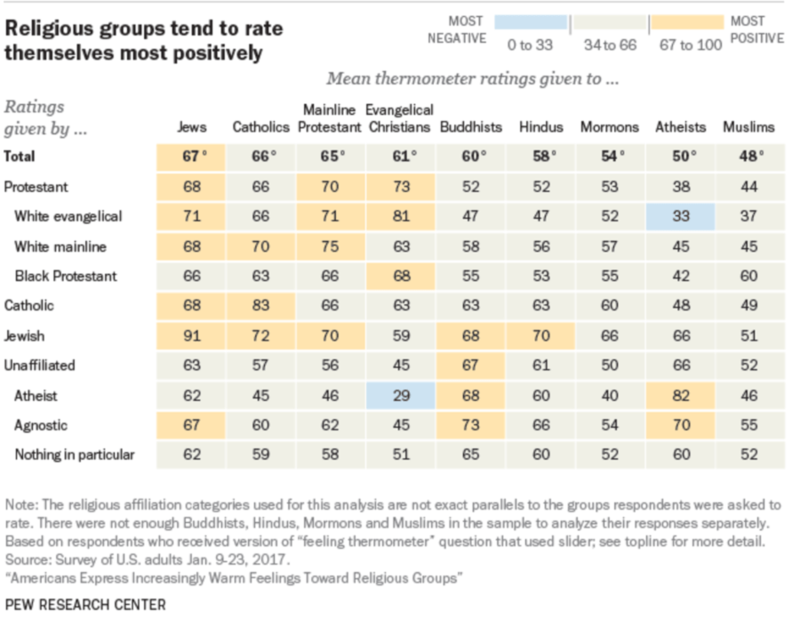 The report, which asked respondents to rate religious groups on a “feeling thermometer” ranging from 0 to 100, found that most people feel more warmth toward their American brothers and sisters than they did the last time the survey was conducted in 2014. That’s not to say that attitudes are warm and fuzzy. In fact, sentiments toward Muslims and atheists remain a cool-Spring-day kind of cold. But we’re getting there. These two least favorably ranked groups increased from a frigid 40 and 41 degrees, respectively, to an almost balmy 48 and 50. Jews and Catholics remain at the top of the list (67 and 66 degrees) with both gaining four points in recent years. Much like actual global warming, these escalating attitude temperatures were shown to affect all Americans: with Democrats and Republicans, men and women, young and old, and members of every religious group expressing more positive views. The rate of change did differ amongst demographics, though. Young adults were more likely to feel warmth for Muslims than older Americans. Jewish people displayed the most acceptance across the board — a positivity that was reciprocated by other religious groups. Republicans felt much more cooly toward Muslims (39 degrees) and atheists (43 degrees) than their Democratic counterparts. Democrats felt the least amount of love for Mormons (52 degrees). One finding of the study is particularly important, if unsurprising: all Americans express warmer feelings toward religious groups when they are personally familiar with someone in the group. This is most evident in the difference between respondents who know a Buddhist and those who don’t; with the people who have met a Buddhist giving the group a 75 — compared to a 56 from those unfamiliar with the religion. This trend applies to every group surveyed (which helps explain the positivity toward the most common religions). This data suggests that one of the keys to promoting peace and understanding is the widening of social circles and the diversification of communities. Barack Obama said as much in his January farewell address — noting that the solution is evident, but difficult. 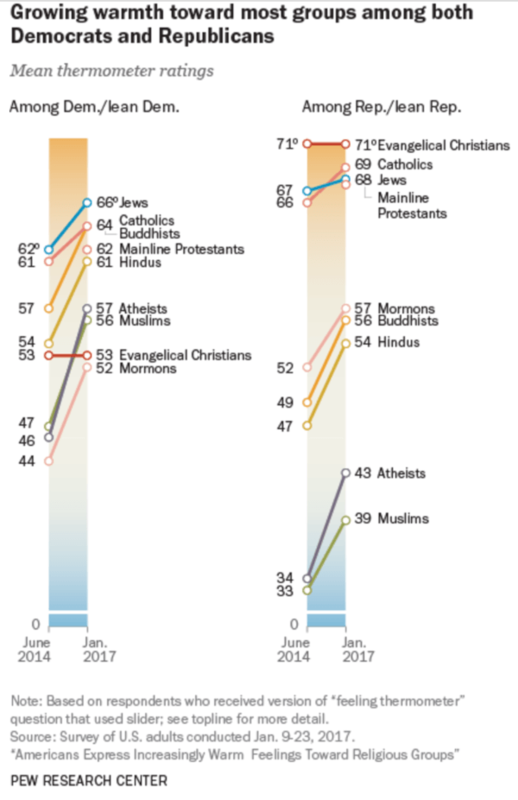 These numbers, which also show that more Americans have met people from other religious groups than they had in 2014, show that we’re on the right track — even if headlines indicate otherwise. Next, read about how rising populism is reminding the Pope of Nazi Germany. Then learn about how Americans are more likely to be killed falling out of bed than by a jihadist immigrant.